The company that provides management services to Yorkville Endoscopy Center, the facility health regulators cited for botching Joan Rivers' treatment after the comedic icon died, also manages other New York-area surgery centers that have failed to meet key medical standards, NBC 4 New York's I-Team has learned. Following Rivers' death, a report from the Centers for Medicare and Medicaid Services said Yorkville “failed to identify deteriorating vital signs” and violated Rivers’ right to privacy when a staff member allegedly took cellphone pictures of her while she was sedated. The I-Team has discovered Frontier Healthcare, the firm that manages operations for Yorkville Endoscopy, also manages operations for three other surgical centers that have failed safety standards in the past. Accreditation survey results, obtained through a public records request, show Manhattan Endoscopy Center, Flushing Endoscopy Center and Queens Endoscopy Center -- all facilities managed by Frontier –- have failed to pass unannounced surveys needed to operate in good standing and collect federal Medicare and Medicaid dollars. In 2013, when Flushing Endoscopy Center sought accreditation from the Joint Commission, a nonprofit that evaluates compliance with medical standards, surveyors found the facility failed to properly clean endoscopes and had no process for managing potentially dangerous medication. Also that year, when Queens Endoscopy Center sought the same accreditation, surveyors from the Joint Commission found staff improperly labeled the anesthetic drugs Lidocaine and Propofol. 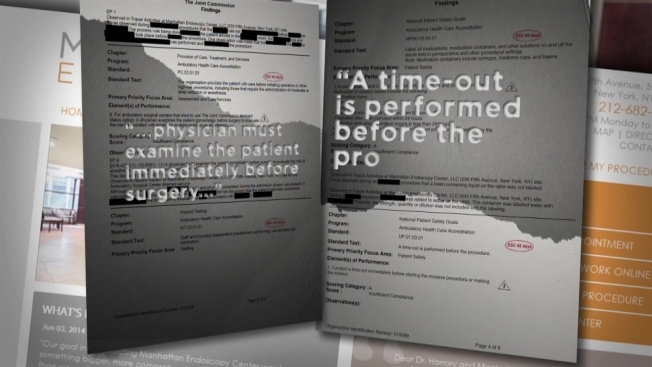 In 2012, surveyors found Manhattan Endoscopy Center failed to examine patients for risks associated with anesthesia and failed to conduct important “time-outs” before starting procedures. A spokesman for Frontier Healthcare sent the I-Team a statement emphasizing that all three surgery centers that failed accreditation surveys quickly corrected their deficiencies and passed subsequent tests. “The fact that during an accreditation survey issues were identified and corrected is not unusual and is within the industry norm,” wrote Bob Zeitlinger, who represents Frontier. “At no time has patient safety been questioned by the regulatory bodies at these three centers since these original modifications were instituted,” Zeitlinger added. Elizabeth Zhani, a spokeswoman for the Joint Commission, said the accreditation cycle for surgery centers is “continuous” and surgery centers can be granted several opportunities to pass unannounced surveys if they have insufficient compliance with medical standards. She declined to say how often surgery centers are cited for failing specific standards like those involving infection control, medication management and protocols before invasive procedures. Anthony DiPietro, a malpractice lawyer who represents injured patients against surgery centers and hospitals, said health regulators should be tougher on ambulatory surgery centers that fail to meet key safety standards. He also suggested safety lapses could fester at surgery centers because they often have fewer managers –- fewer checks and balances. After regulators from the New York State Department of Health issued a 22-page report detailing a litany of patient safety violations leading up to Rivers' death, the surgery center submitted a plan of correction promising better handling of anesthesia, better respect for patient privacy and improved protocols for responding to emergencies. Federal regulators said Monday that effective Jan. 31, the facility will no longer be eligible to receive funds for Medicare and Medicaid beneficiaries because of continued non-compliance with certain requirements regarding management and surgical and other services. Yorkville is appealing. Bill Prentice, CEO of the Ambulatory Surgery Center Association, a trade group, said independent surgery centers are as safe if not safer than traditional inpatient or outpatient hospital surgery settings.